Alternate Titles: Chocotan!, Ribon Festa 2013, Ribbon Festa 2013,チョコタン! This story is about the dog named Chokotan who has the ability to speak with humans in the human language. Nao, her owner, likes a guy named Arima. Arima has a dog named Hatsupi. On Hatsupi's birthday, Nao makes biscuits that are edible for both dogs and humans. Nao and Chokotan bump into Arima and Hatsupi on the sidewalk and Nao runs away before she can summon the courage to give the biscuits to Arima. Chokotan encourages Nao and she makes up her mind to go back and give the biscuits to Arima. Now then, will she be able to approach Arima while she's not even able to talk casually to him? And how about Chokotan's secret? 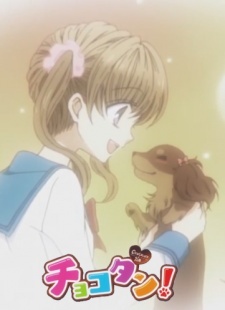 - The Story about the talking dog and her Owner's clumsy-love-story! Watch Chocotan! Episodes Online at Animegg.org. Chocotan! is available in High Definition only through Animegg.org. Choose an episode below and start watching Chocotan! in Subbed & Dubbed HD now.